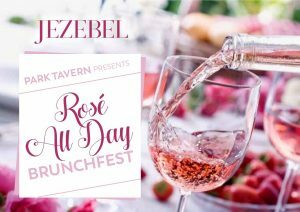 Pop endless bottles of rosé during the All-Day Rosé Brunchfest at Park Tavern in Piedmont Park hosted by JEZEBEL Magazine’s 20 Most Eligible Atlantans on Sunday, August 5, 2018. Beginning at 12:30 p.m., brunch lovers can nosh on savory breakfast bowls; tater tots smothered and covered; toasted bagels served with cream cheese, cured salmon, and capers; a Krispy Kreme station with all the fixings including: whipped cream, strawberries and chocolate; a biscuit station with county ham and sausage; and much more. 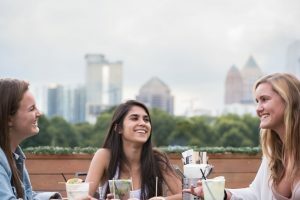 Patrons can also enjoy libations such as a selection of rosé, mimosas, Bloody Marys served with fresh cocktail shrimp and more, while enjoying a high energy live music performance by NAKD. For ages 21 and up, General Admission tickets are available beginning at $15 and include two food or drink tickets. The All-Day Rosé VIP experience includes early entrance, all-day access to the Rosé Olmstead Room, an indoor bar featuring leather seating, air conditioning, indoor air-conditioned restrooms, six selections of bottomless rosé, and two food or drink tickets for $45. In addition, food station tickets will be available for purchase for $8 each. Finally, to purchase tickets, visit, https://www.xorbia.com/events/parktavern/RoseBrunchfest2018. This event is rain or shine. For more information, visit www.parktavern.com.